Proceed with caution with these items! That yellow crime scene tape is easy to see and demands attention. Just like you! Which makes it the perfect design for all kinds of products. From scarves to bandages to neckties to belts - you can find just about anything in the distinctive yellow and black. As I discovered when I went looking for them! The types of products vary over time so there will be a constant change to what you can get. Items below have either "Crime Scene" or "Police Line" or "Caution" and the words "Do Not Cross". I've avoided "danger" and others that don't come in yellow and black, but there are tons of items in that design as well. The difference in writing on the tape often has to do with the difference in America and other English speaking countries. Tell the truth. Did you steal my Baby Ruth? Sometimes the crime scene takes up just a tiny space, so you don't really need all that big yellow tape. Mini Crime Scene Tape to the rescue! Mark off the printer where someone failed to add more paper or the corner of the fridge where a sandwhich has gone missing. Perfect size for those little crimes. Check out a couple other options for tape below. 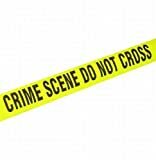 One is regular big standard crime scene tape, and there are a lot of options for that stuff out there. I liked this one because it was 200' long, and can you just imagine the kinds of things you can do with that much tape! The other is another mini version, although it says biohazard. I liked it so it got to come along for the ride even if it isn't exactly the right type. This Crime of Passion Scarf is acrylic with a touch of spandex and 100% ironic for that extra oomph! It's just shy of five feet long... long enough to make your statement AND stay warm on those bitterly cold winter days! Says "Crime Scene" and "Do Not Cross". Check out the other ideas I found below in clothing and accessories. Some made out of actual crime scene tape! I tried to stick with normal items; OK, as normal as they can be with this style. So the weird Lady Gaga costume got bumped. They might not completely hide the scene of the crime, but your wounds will appreciate the coverage of these crime scene bandages. Each 3 3/4" tall metal tin contains twenty-five 3" x 3/4" bandages with sterile gauze and a free toy to take your mind off of the excruciating pain. For best results apply to body parts not already outlined in chalk! Check out below a few other random things I found that use crime scene tape for the design. Guitar strap and pet collar - can't get much more random than that! Freeze! Drop the sandwich and put your hands over your head! Keep inconsiderate co-workers from pilfering your lunch with these crime scene tape lunch bags.Two threatening styles to discourage theft! Measure 8.75 inches long x 7 inches wide. 20 clear, locking plastic bags (10 of each design). There are so many options for home decor stuff that involves crime scene tape. I've got just a few listed below - my favorites, of course. I had some others like rugs and blankets, but they tended to use chalk outlines and be more about the scene than the tape, so they got bumped. We've all heard about fingerprints and their use in criminal investigations but how have they come to be used so widely? Hanging was the main form of punishment in the British Isles from Anglo Saxon times up until its abolition in 1964. It was almost a family day out.